Start a healthy life style with this smart bracelet! Monitors heart rate, blood pressure and sleep. Tracks activities like steps, distance, calories burned. BT4.0 connection, suitable for Android 4.4 or above, for iOS 8.0 or above. Check daily, weekly, monthly, and yearly data to see progress on App. Calls, messages and app notifications. Smart reminder: taking medicine, alarm, sedentary reminder, drinking reminder. Easily charge with any USB-port device, one single charge gives up to 3-7 days standby. IP67 waterproof, remote camera, find phone, raise wrist to light up screen. 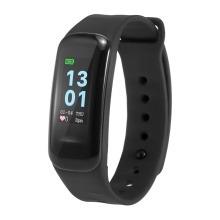 Lightweight, comfortable TPU band, perfect gift for both men, women, kids. Note: The heart rate and blood pressure monitored are for reference only, not for medical purpose.